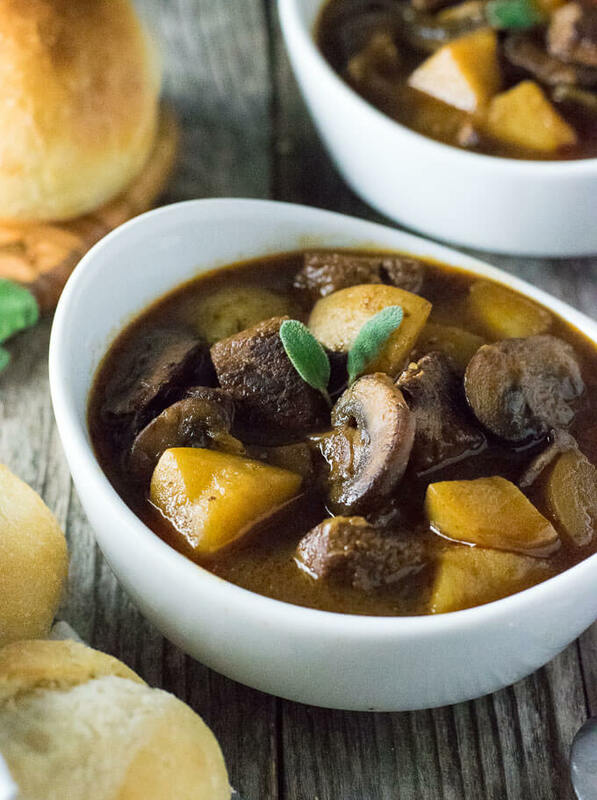 This luxurious venison stew is brimming with tender chunks of seared venison, Yukon gold potatoes, and mushrooms in a rich and silky sage infused broth. Venison loin gets all of the attention. It is like the charismatic star quarterback of the high school football team that everyone can’t stop fussing over. 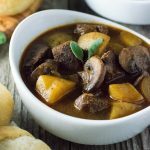 Cuts like venison stew meat are shunned from the limelight until you find your freezer is running low and you have to use up the leftover cuts of meat before freezer burn sets in. Only then does stew meat get a chance to shine. Well, that changes now. 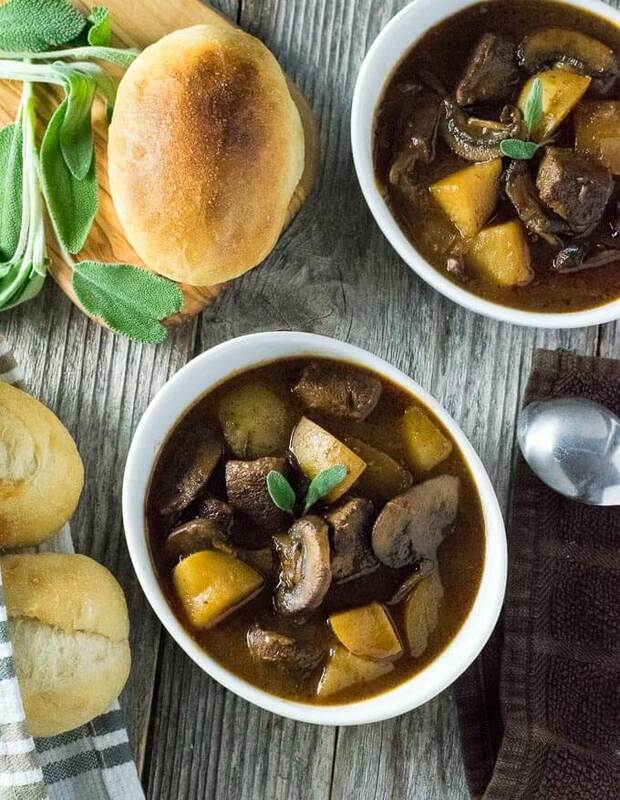 This venison stew recipe will quickly become one of the most requested recipes in your repertoire. 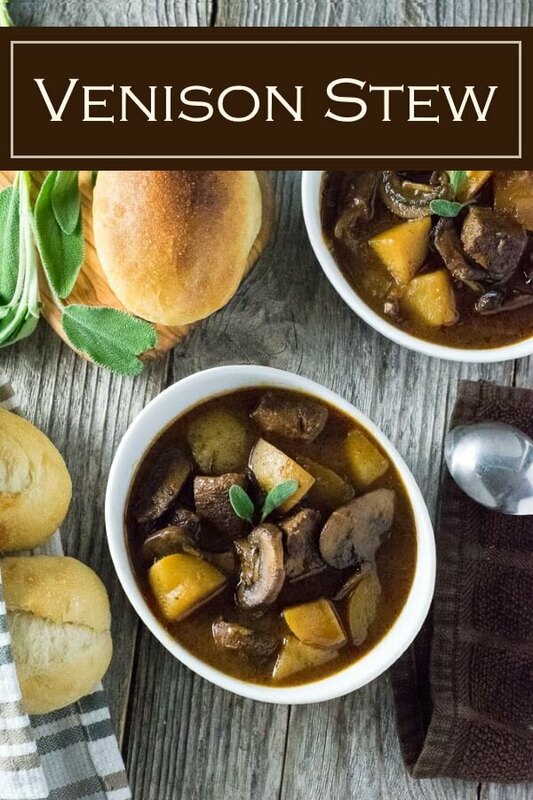 I promise you, this venison stew recipe is a winner. The sauce is thick and rich, the ingredients are tender, and the sage adds a subtle floral note. It is hearty, yet well balanced. I recommend using Yukon gold potatoes in particular for this recipe. Yukon golds hold up better to longer cooking times, staying tender and creamy, compared to baking potatoes like Russets, which become mealy and fall apart. Baby red potatoes can be substituted for Yukon golds if needed. 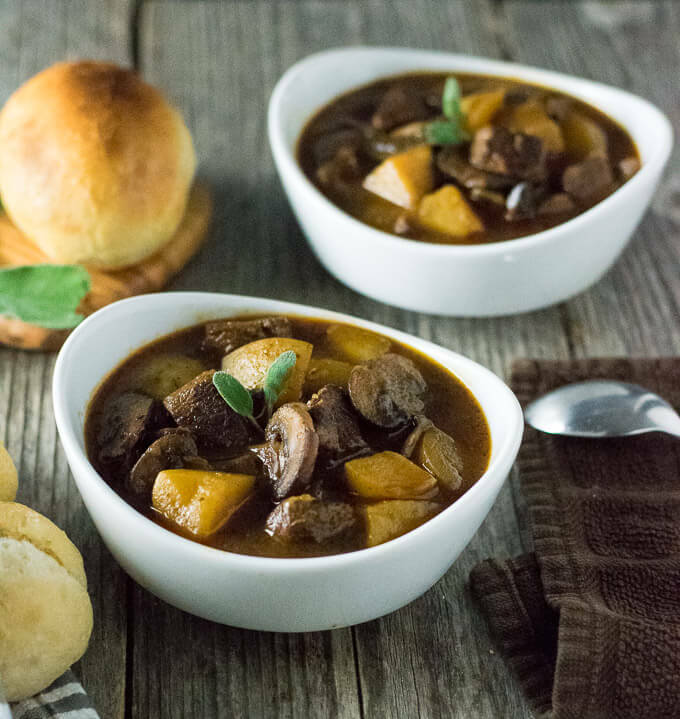 Venison stew is easily customizable to fit anyone’s taste. For example, if you are not a fan of mushrooms, you can easily omit them from the recipe. Alternatively, you can also add ingredients like carrots and peas to the stew if desired. The herbs used can also be adjusted. Personally, I think sage is a phenomenal pairing with venison (which is why I also use it in my venison meatloaf), however, you could substitute a sprig of rosemary or a couple sprigs of fresh thyme instead. My recipe calls for simmering the stew for two hours. That is enough time to ensure the meat and potatoes are tender, and gives the flavors a chance to meld a bit. However, there is no reason why you can’t let it simmer all afternoon, like a good venison chili, if needed. Simply add a bit more liquid to the pot if too much simmers off during an extended cooking session. 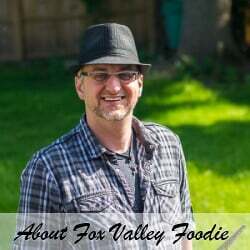 I know most hunters aren’t professional butchers, so they don’t always separate the meat into ‘stew meat’, ‘steak meat’, etc… If that sounds like you, don’t worry, you can use any meat in a venison stew and still get great results. However, there are some cuts better suited for stewing than others. In particular, I save the shanks for my stews. The shank is the meat found on the upper leg. It is a meaty cut that is laced with quite a bit of sinew or silverskin. Many hunters add this to the grinding pile for venison burgers and other such dishes, when processing their own meat. Don’t do that! The silverskin found on the shank will slowly melt away when added to a stew, leaving you with clean, tender, chunks of venison in the final dish. As a general rule, if I can see through the silverskin, it is safe to leave on the meat. If it is too thick to see through, it gets trimmed off. I prefer to make this recipe in a Dutch oven, and let it simmer on the stove top. However, slow cookers are great for letting your venison stew simmer all afternoon. You will still want to sear and saute the ingredients prior to adding them to your crock pot, to develop maximum flavor. Additionally, you cannot make a proper roux in the crock pot, which is used to thicken the strew. Therefore you will also want to make a roux in a skillet and then add it to the slow cooker. Basically, follow steps 1-5 of the recipe as written, then once everything is ready to be combined and simmered you can add it to the slow cooker and let it sit all afternoon until you are ready to eat. Working in batches as necessary, add cooking oil and venison to a large skillet over medium-high heat and sear venison on all sides until a brown crust forms. Remove from skillet and set aside. Add additional oil if needed and saute the onions and mushrooms in the skillet until tender and onions begin to brown. Add minced garlic and cook for an additional 2 minutes, or until fragrant. Remove onions, mushrooms, and garlic from the skillet and deglaze with 1/2 cup of beef stock. Whisk and scrape the bottom of the pan to incorporate all of the burnt on fond into the liquid. Pour off and reserve deglazing liquid with venison and vegetables. Melt butter in a soup pot or Dutch oven over low heat and sprinkle in flour to form a roux. Whisk continually for 5 minutes, to prevent scorching, or until roux turns from blond to a light brown. Slowly incorporate beef stock into the roux, mixing to combine as it is added. Add venison, mushrooms, onions, and garlic to the soup pot along with the reserved deglazing liquid, tomato paste, Worcestershire sauce, bay leaves, one sprig of sage, and fresh ground pepper. Cover the pot and let simmer for two hours. 10 minutes before serving, add an addition sprig of fresh sage and taste for salt, adjusting as needed. Serve with hot dinner rolls. The searing of the meat and sauteing of the vegetables can be done in the Dutch Oven if desired. However, I find I often get a better sear if using a metal or cast iron skillet. This recipe can be made a day prior, allowing the flavors to meld in the refrigerator overnight. Bring stew back to temperature and serve. IF YOU LIKED THIS RECIPE you will love my Beer Braised Venison Neck recipe too. This is basically the same way I do venison, with carrots. I have been using my Instant Pot lately and I leave out the spuds. I cook them separately and mash, then serve the venison over the mashed potatoes.